Team Cyclops known as makers of the “CycloWiz for the Wii” – the first mods ever produced for Wii have now developed a new slot-1 flash for the Nintendo DS. This flashcard is promising a great variety of features. CycloDS Evolution is superb due to several reasons – mainly because you can boot it easily within seconds from the DS cartridge. Also you don’t need any extra hardware. As simple as that once booted it offers a variety of possibilities: slow motion gameplay, playing backups, listening to music, DLDI patching, watching videos, Action Replay compatible cheats, reading e-books, not to mention the feature of SDHC support that enables you to expand capacity up to 32 GB on a MicroSD card (I found only 8GB max), as well as full download play support. Action Replay compatible cheat code engine, comes bundled with cheat codes for over 300 games! 2 megabytes of onboard flash memory which contains the CycloDS Evolution OS and will be utilised in the future to add exciting new features. A recovery mode is also included. 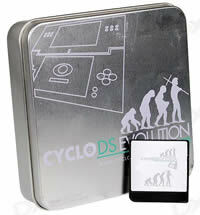 CycloDS Evolution is delivered in an appealing small metal box similar to DSLink wrapped in a plastic cover. The cartridge itself is placed in a protective foam layer. The inside packaging includes also an instruction manual and a USB MicroSD memory card reader. 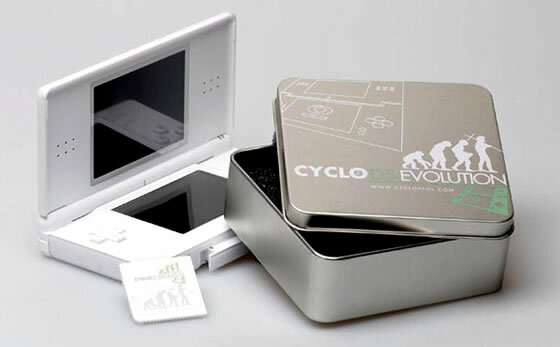 The tin metal packaging features CycloDS Evolution trademark on the front and a printout of features included on the reverse. The cartridge looks like an average flashcard made of thin plastic. The CycloDS Evolution is provided in white casing, however more colours will be available. The cartridge looks like an average DS cartridge – same shape and size. The cart perfectly fits in when inserted into console. The cart surface is slightly raised and you can feel the chip underneath it, however it is just appearance failure and does not influence the operation of the cart. The cart does not look state-of-the-art (there certainly are many smooth surface and cool design carts on the market), but don’t worry about it because cart’s superb features make up for this. A slight potential drawback is the lack of spring function – you have to manually drag it out which is a bit of nuisance. However knowing that spring loading breaks if used often, maybe it is for the best. The good thing about CycloDS Evolution is that it boots up within seconds from the DS cartridge. You simply have to insert it in the Nintendo DS or Lite and switch it on. Then you will see 3 menus: settings menu, media menu, games/homebrew menu. The settings menu allows you to enable cheat codes and to enable the enhanced mode, adjust screen brightness, to select language (for example, English, French, Spanish, German, Korean, 9 languages in total). You can also change CycloDS Evolution skin to your choosing – there are hundreds available for download on their official website. Another great feature is that from the settings menu you can boot slot 2 which means that you can use DS Evolution as a PassMe. The media menu enables you to read e-books, play audio, watch video files and images. In order to do that you have to download a version of MoonShell. You will be able to read multimedia files such as jpg, text, video, mp3 and other once you have installed the Moonshell. In order to watch a movie you have to convert it into a DPG format. This is done by choosing a movie file (e.g. DivX) and the DPG application will convert it into DPG file. This process takes few minutes and you will experience some file quality lost, however the overall file performance is rather good. When you have converted the files you can drag them to the memory card and then go to Media menu, then to Moonshell and then select the movie you want. Enjoy ! The game/homebrew menu shows you the directory of the cart, as well as shows name and icon of NDS games. Simply go to the Game menu and you will be presented with the contents of the SD card. The screen operates as usual – you have to hold down or move up the stylus, tap the folder you need, tap NDS file to start it etc. If you are using buttons you can also skip pages by help of L and R buttons. If you want to play ROMs simply copy the ROMs to the MicroSD, insert it and select the ROM you want to boot. Loading process is few seconds, depending on the size of ROM. You don’t need to pre-patch the ROMs because CycloDS Evolution has the automatic DLDI patcher which provides 100% compatibility for homebrews or commercial ROMs. Also explore the previous ROM boot option which allows you to boot the last ROM used without going through all the menus. Press L+R when starting CycloDS Evolution. Great isn’t it? I tested the CycloDS with few homebrews as well as some ROMs. Battery life is approximately 4,5 hours. Slow motion – one of the most interesting features. Works flawlessly and is very useful when you have a fast game. It slows down the game and allows you to perform stunts and figure out difficulties. However the slow motion works unevenly – sometimes it will slow down when there is no real action on the screen or vice versa – becomes faster during a real game situation. Soft reset – a possibility to return to main menu during the game with no need to turn the DS off. Auto DLDI patch – no need to pre-patch ROMs. Cheats - cheat support has cheats for 300 games. This function is not a default one and you have to enable it on the settings screen. When you load the game the cheats database will be automatically checked and if there are cheats found you will be presented with choice to enable them or not. Also you won’t have to re-enable cheats again as cart will remember. To sum it all up - CycloDS Evolution is the best Slot 1 cart on the market right now. The auto DLDI patch, slow motion, SDHC compatibility, cheats, not to mention 100% compatibility with ROMs and homebrew make this cart worth the money.